LGF metal dome array is a new design metal dome array, add a LGF layer on the top of normal dome array. LGF, which full name is Light Guide Film. When we add a LGF on current normal double layer or EMI dome array, it becomes a LGF dome array. It can achieve great result of light distribution. As everyone knows, the light under keypad is coming from the LED on PCB motherboard. We need to put about 8-10 pieces LED on each board, but if the design changed to use LGF, then we can save several LED, as well as SMT fee. LGF, at least one surface out of front and rear surfaces of the light guide film is formed with a pattern such that density increases as distanced from a light source to allow light to be uniformly supplied to the keypad, or is concentratively formed with a pattern at a particular region of the light guide film to allow the light to be concentratively supplied to a particular region of the keypad. On the motherboard of mobile phone, through the optical refraction, only 1~4 pcs LED will be enough for soft and high light luminance, if using our LGF dome array (mobile phone LGF). 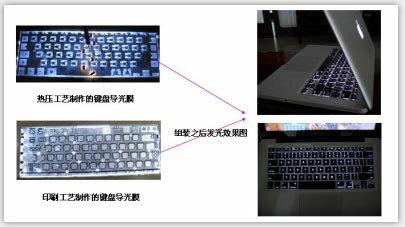 At the same time, we can adjust luminance of the black area during the design to achieve the value to 30CD/M2. Our LGF dome array can be used widely in high value added mobile phone, solving the problem of uneven of luminance, high power-consumption, big room space requirements and high costing. We can make LGF dome array in various color and shape, also adjust different artwork to make LGF, such as printing, mould punching, etc. Please contact us for more information about LGF dome array. Soft, flexibility and elasticity, thickness is about 0.125mm which does not need too much space. Save LED & power consumption, two LED will be enough for small area mobile phone LGF. Great stability, long durability, the life cycles can reach up to 1 million times. 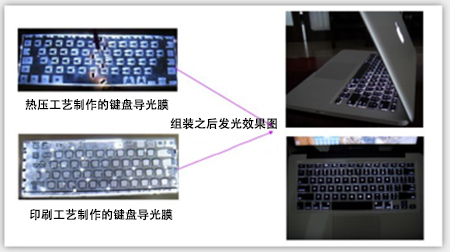 When assembly with metal dome array, LGF will not affect the clicking feeling.